Description: This tree usually has a single trunk up to 5' across and a conical crown up to120' tall. The leafy lateral branches have a tendency to arrange themselves in horizontal layers. 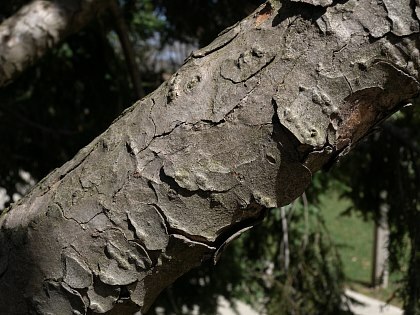 Trunk bark is gray or gray-brown, consisting of broad flat plates and shallow longitudinal furrows. Branch bark is gray, smooth, and sometimes irregularly fissured, while young twigs are hairy and yellowish to reddish brown. The needle-like evergreen leaves are arranged primarily in 2 opposite ranks on the lateral sides of twigs; some appressed leaves develop along the upper side of each twig. Individual leaves are ½-¾" long, linear in shape, and flattened; they have short petioles (less than 1/8" long) and blunt tips. The upper leaf surface is medium to dark green and glabrous, while the lower is whitish green or whitish blue-green and glabrous. Along the lower surface of each leaf, there are 2 white lines that run parallel to each other. Eastern Hemlock is monoecious, producing both pollen cones and seed cones on the same tree. Pollen cones occur near the tips of leafy twigs, while seed cones occur at the tips of such twigs. Each pollen cone has a yellow globoid head about 1/8" across that consists of several globular packets of pollen; the pollen head has a light green stalk at its base that becomes longer with age (up to 1/3" or 8 mm. in length). At the time when cross-pollination occurs, the scaly seed cones are 1/3" (8 mm.) in length, ovoid in shape, and green. The cones are wind-pollinated during the spring. Shortly afterwards, the pollen cones wither away, while the seed cones continue their development. At maturity, the seed cones are ½-1" in length and ovoid to ovoid-globoid in shape, becoming brown from thin woody scales. At the base of each scale, there is a pair of seeds with elongated membranous wings. The released seeds can be blown about by the wind. The spreading root system is shallow to moderately deep. This tree reproduces by reseeding itself. Cultivation: The preference is partial shade, cool moist conditions with good drainage, and acidic soil. In the wild, this tree is usually found on rocky ground, but it will adapt to non-rocky areas in cultivation if the pH is not too high. Growth is relatively slow, especially in shady areas, and individual trees can live to 500 years. Range & Habitat: At the present time, there is a naturally occurring population of Eastern Hemlock at Starved Rock State Park in LaSalle County (see Distribution Map). This population appears to be reproducing. Elsewhere in Illinois, this tree appears to be absent, except where it has been planted or cultivated. Eastern Hemlock is more common in the Appalachian mountains, New England, and parts of southeastern Canada. Habitats include rocky bluffs, wooded hillsides (especially those facing north or east), rocky ravines, and rocky areas along streams. The underlying bedrock of these habitats is acidic (e.g., sandstone or granite). Because of its attractive evergreen foliage, Eastern Hemlock is often cultivated as a landscape tree. Faunal Associations: In the Appalachian mountains, the introduced Adelges tsugae (Hemlock Woolly Adelgid) has been decimating populations of Eastern Hemlock. This cottony insect is usually found in clusters on the undersides of twigs. Other insects that feed on this tree include the larvae of the metallic wood-boring beetle Melanophila fulvoguttata (Hemlock Borer) and the larvae of several long-horned beetles: Leptura subhamata, Semanotus litigiosus (Fir Tree Borer), Tetropium velutinum, and Xylotrechus integer. Other insect feeders include Abgrallaspis ithacae (Hemlock Scale), Fiornia externa (Elongate Hemlock Scale), Neodiprion tsugae (Hemlock Sawfly), Plagiognathus tsugae (Hemlock Plant Bug), Otiorhynchus sulcatus (Black Vine Weevil), and the caterpillars of several moths (see Moth Table). The seeds of Eastern Hemlock are eaten by such birds as the Black-Capped Chickadee, Red Crossbill, White-Winged Crossbill, and Pine Siskin, and by such mammals as the Red Squirrel, White-Footed Mouse, and Woodland Deer Mouse. White-Tailed Deer browse on the twigs and foliage, while the Beaver feeds on the wood and bark. Eastern Hemlock provides suitable nesting habitat for some migrating warblers; these species include the Black-Throated Blue Warbler, Black-Throated Green Warbler, Blackburnian Warbler, and the misnamed Magnolia Warbler. Because of the protective cover of the evergreen foliage, Ruffed Grouse, Wild Turkey, Owls, and other birds often roost on the branches of this tree. Large hollow trees have been used as dens by Black Bears; when they feel threatened, Black Bear cubs will climb Eastern Hemlock trees to reach safety. Colonies of this tree are often used as 'deer yards,' where White-Tailed Deer seek cover and bed down for the night. Photographic Location: The campus of the University of Illinois in Urbana, Illinois. Comments: The widely scattered populations that exist along the fringes of Eastern Hemlock's primary range may be useful in preventing this tree's extinction from such invasive pests as the Hemlock Woolly Adelgid. It is to be hoped that an effective biocontrol for this insect will be found in the not too distant future. Eastern Hemlock is closely related to Tsuga caroliniana (Carolina Hemlock), which has a much smaller range in the Appalachian mountains. 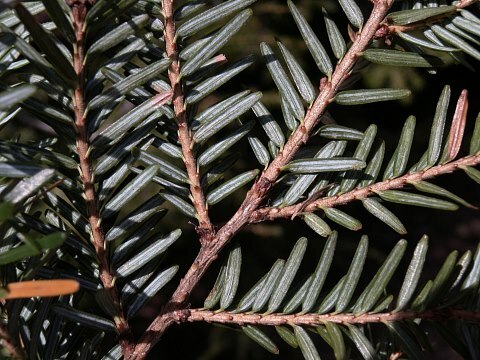 Compared to Eastern Hemlock, this latter species has slightly longer seed cones (1-1½" in length) and its needle-like leaves are less strongly divided into 2 opposite ranks. The foliage of Eastern Hemlock bears a surprising resemblance to the foliage of cultivated Taxus spp. (Yews), which can become small shrubby trees if they are not pruned. 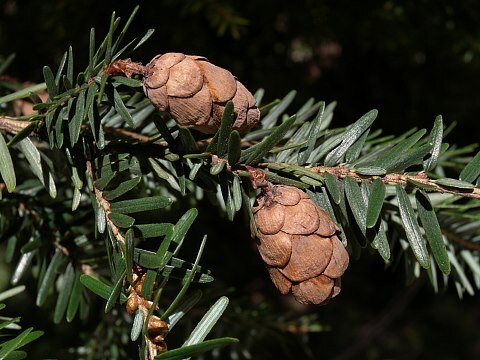 However, Yews have smaller seed cones that are red and berry-like in appearance, while Eastern Hemlock and other conifers in the Pine family have larger cones with woody scales.